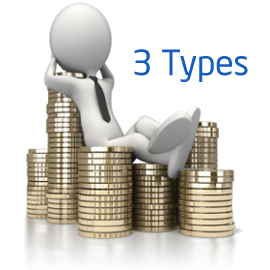 Few days back we had a discussion about 3 different types of Investors. Today we will discuss about 3 types of Income. In simple word income is sum of wages, salary, profit, interest, commission, rent of other form of earning received in given period of time. This Income can be fixed income or variable income. For salaried people income is fixed while for business people income is variable. It is always recommended to have multiple source of Income. That is the reason we invest our money to make more money. Earned income is divided in two parts first is job income. Job income is income received from paid work. Generally salary income of Job falls under this category. This income is highest taxed income without escape. It is very difficult to build wealth by this income. Another type of earned income is business income. Any income that is realized from business activity falls under this category. Business income is taxed differently. It is easy to build wealth by this income. Portfolio income is derived from earned income. Earned income can be invested to gain portfolio income. Portfolio is made up from asset like stocks, mutual funds, gold, real estate etc. For portfolio income If you hold your investments for longer duration tax applicability will be very less hence It is easy to build wealth by portfolio income. Passive income is most powerful and profitable source of income. It is type of income which comes regularly regardless of work. In other word work one time and get income lifetime. This income is derived from royalties, commission, real estate rent. This income is lower taxed income and it is easiest income to build wealth with. Passive income is best income. If you want to be wealthy, work for passive income. « Sensex hits an all-time high: What should you do now?